This is a guest post submitted by my boyfriend, Tyler. 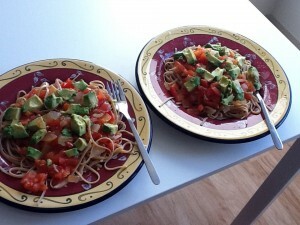 I’ve talked up his famous avocado pasta to a lot of people, and I recently posted a photo of it on Facebook, which was met by many requests for the recipe. Tyler has graciously written it up for the sharing. Enjoy! Saute onion, garlic, and olive oil in pan over medium heat for 5 minutes. Add salt, pepper, oregano, and red pepper flakes to taste. Stir in tomatoes and let sauce cook for additional 8-10 minutes, stirring occasionally. Top pasta with sauce and add avocado and finally lemon juice to taste. Enjoy and follow up by playing some Starcraft with Tyler (Thelonious.918). Love this recipe! But now I know which ingredient I always miss…..Tyler! I make almost the same thing with Mozzarella instead of avocados, and sometimes with balsamic vinegar. It is one of my (and Henry’s) favorite things!